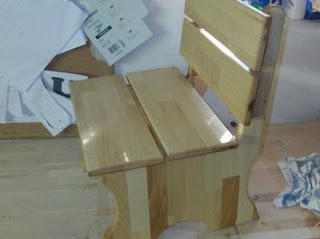 The third piece of furniture my son, is made of 18 mm beech laminated wood, it should fit the existing stool. The steps are similar to the stools, but I have yet again added a construction manual with drawings. The desired shape of the side parts is transferred to a 9 mm plywood, in my case, the chair should have a shape similar to the stools. 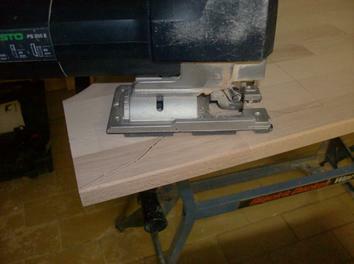 The contours are cut cleanly with the jigsaw and then smoothed with sandpaper. The clean the stencil, the better the original. 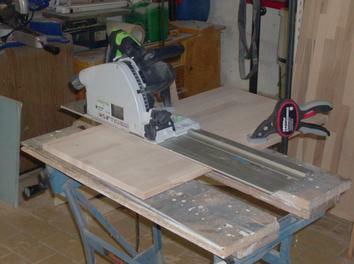 The blank was made with the portable circular saw with guide rail. My prefabricated template I transferred to the cut sides. 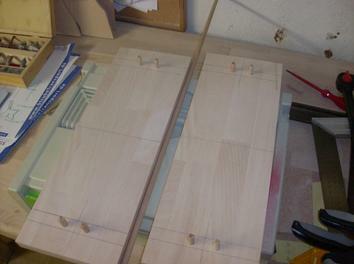 Since I ausfräse the contours of the side parts with the router and trim bits, I have attached the template with two small screws on the workpiece. The lower screw hole serves as a teaser for the 25 mm Spell. 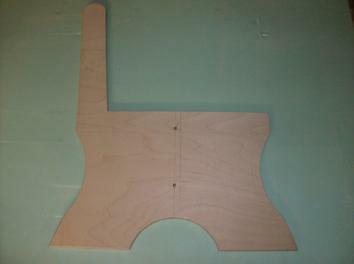 The contours of the side parts I coarsely with a jigsaw cut approximately 3mm from the scribe. 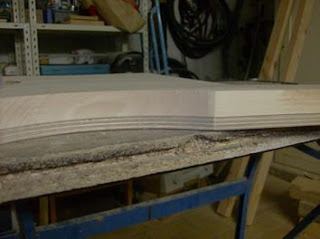 The final contour of the side parts I milled with the router and trim bits. It is important to ensure that does not shift the stencil and the ball bearings of the cutter clean abuts the template. 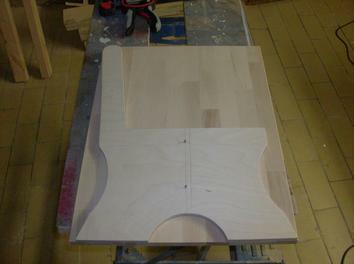 The final position of the seat surface and backrest on the sides is marked (around is the seat and backrest 20 mm before). 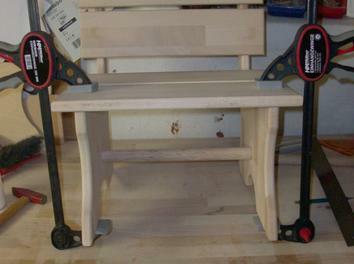 the holes will then 8 mm milled in both workpieces with the Duo-Dübler. To make sure that everything fits together stuck to possibly be able to rework again. 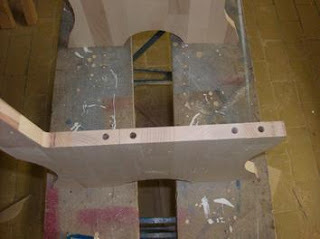 The 25 mm holes for the cross strut were drilled with the router. By screwing the template on the workpiece was the lower attachment point at the same time the scribe of the crossbar. 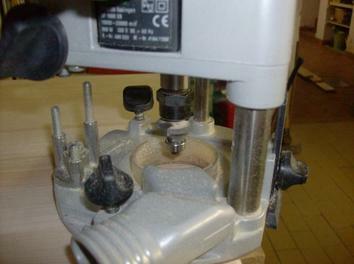 When drilling necessarily Edgings inferior. All edges have been broken with the router and 4mm ogee. 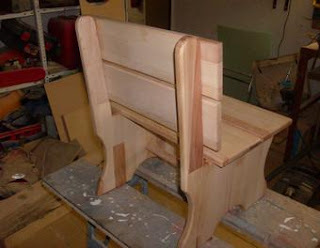 All parts were sanded before gluing together with the sander and 240 grit. All parts are thinly coated with gum, into the dowels and glue brought in. 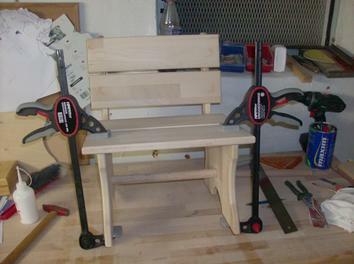 subsequently the parts are put together and wipe with clamps fixed. 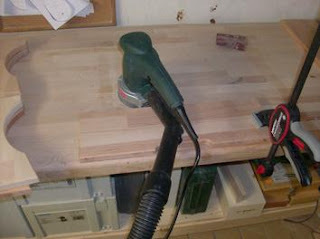 excess glue immediately with a damp cloth away. 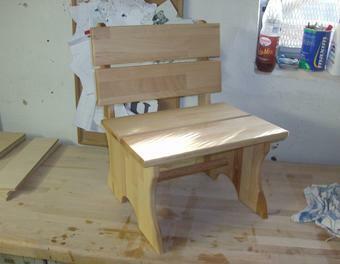 The children's chair is treated with hard wax oil, which is applied with a linen cloth. 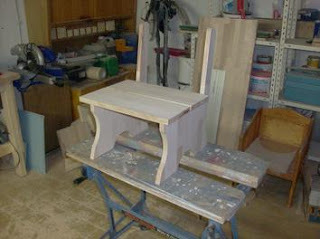 After the first application of the chair with 400 grit sandpaper is lightly sanded and then treated with a further 2 × oil, after the last order of the chair is polished with a lambskin cap on sander.